Low self-discharge, high specific energy density and low memory effect make lithium-ion batteries (LIBs) appealing as chief energy storage devices. Of the different components of a battery, electrode materials have an important part in improving electrochemical characteristics. Hence, synthesizing enhanced electrode materials for high-performance LIBs has been one of the main aims of associated research fields. 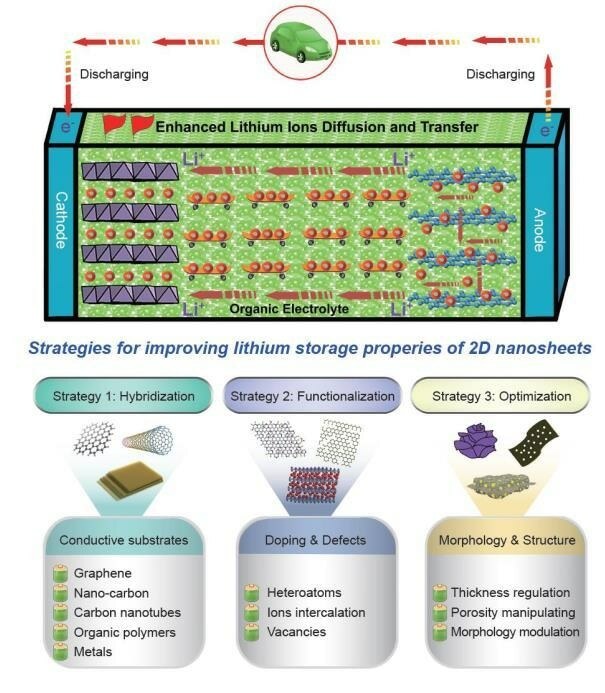 Strategies for improving the lithium storage properties of 2D nanosheets. CREDIT: Science China Press. Transition metal dichalcogenide (TMD) nanosheets, transition metal oxide (TMO) nanosheets, graphene and so on—which are two-dimensional (2D) nanomaterials—are formed of one or more monolayers of atoms, or unit cells. In the recent years, these materials have attracted considerable interest, mainly because of their exceptional chemical and physical characteristics as against their voluminous equivalent. Using 2D nanomaterials in energy storage devices might enable overcoming the main challenges posed by ever-expanding universal energy requirements. Sadly, such sheet-form materials cannot be used directly due to innumerable difficulties, including comparatively lower conductivity, grave self-agglomerating propensity, and the more pronounced alterations in volume during repeated charging-discharging cycles. Researchers from the Queensland University of Technology and the University of Wollongong in Australia have reported recent advancement in the approaches used for improving the lithium storage performance of 2D nanomaterials in a recent review paper published in the journal National Science Review. Such approaches for regulating the characteristics and structures have been anticipated to overcome the main hurdles in using for enhanced nanomaterials for energy storage applications. Jun Mei, Yuanwen Zhang, Ting Liao, Ziqi Sun and Shi Xue Dou—who are the Co-Authors of the paper—categorize these approaches into three primary approaches, namely, structural optimization, surface/edge functionalization and hybridization with conductive materials.